We woke to a still foggy day and after breakfast wandered into town for a coffee and wifi fix and then a visit to the local museum. It had a good selection of Celtic and other early artefacts, a few medieval items and then a huge leap to the 1798 rebellion and subsequent history. A bit of a gap there. One good find in the associated shop was a book written about the old Kilraughts churchyard with all the memorial inscriptions and some history about the people. It will be a huge help for the family history research. We got soaked on the way back to the house and spent the rest of the day getting organised to return home. This evening as we were driving down to the Belfast docks, we noticed a strange light low in the sky on our left. It was too high to be on a building and the wrong shape for a mast. We were well past the airport but as we were on the motorway, could not stop for a photograph. With a few hallucinogens or enough alcohol on board, I am sure it would resemble a UFO but a little further on, it became clear that it was a section of the moon, sandwiched between clouds which were reflecting the light. 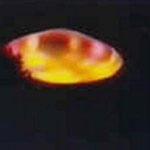 As I could not take a photo, I have grabbed one from a website which claims to have the best UFO shots. Now we are tucked up in our cabin for a short night.